Arizona police often charge drivers with aggressive driving when they observe speeding and multiple moving violations. The Arizona Department of Transportation, in conjunction with law enforcement agencies, take aggressive driving very serious with the goal of reducing accidents. What is Aggressive Driving under Arizona Law? Defending Against the Aggressive Driving Charge. The aggressive driving statute is complex because it contains several elements, each of which, must be proven at trial. The prosecution must establish more than just three moving violations: it must prove that the driving behavior caused an immediate hazard to a person or vehicle. In addition, all of the violations must have occurred during a fluid and continuous period of driving—there cannot be intermissions between the violations. Each alleged violation also has its own available defenses. For example, any defense to a speeding allegation may be used as a defense to aggressive driving. Lastly, common constitutional arguments include Miranda and right to counsel violations. Does an Arizona Aggressive Driving Conviction result in a criminal record? Yes and it’s permanent. Arizona’s aggressive driving isn’t eligible for “expungement” or set aside—meaning you’ll always have a criminal record that’ll show up in background checks. Aggressive Driving Penalties and Consequences. Arizona’s aggressive driving is a Class 1 Misdemeanor. A driver convicted of aggressive driving faces a permanent criminal record with both mandated and discretionary penalties. With up to 6 months jail, three years probation, $4,575 in fines, and the potential suspension of your driver’s license, aggressive driving is more than just a traffic ticket. An aggressive driving citation initiates a criminal prosecution that can affect your record, driving rights, insurance, and finances. In addition, an aggressive driving conviction carries 8 MVD points that attach to your license; this triggers either a license suspension or traffic survival school. Upon a conviction, your insurance rates will likely increase, or even worse, insurance companies may cancel or deny coverage. What are the maximum penalties for Arizona’s Aggressive Driving? What are the potential penalties and consequences of Arizona’s Aggressive Driving? Can My License be suspended for Aggressive Driving in Arizona? Yes, for two reasons. First, an aggressive driving conviction applies 8 points to your driver’s license that triggers a 3 month suspension. Usually, the suspension can be avoided by taking traffic survival school; however, if you had existing points on your license at the time of the aggressive driving, a license suspension may be mandatory without the option for traffic survival school. Second, the judge has the discretion to suspend your license for 30 days. This would typically happen if the judge found aggravating circumstances or prior driving history. If it’s your second aggressive driving conviction within 24 months, your license will be revoked for a year. How Does Arizona’s MVD Points System Work? How can I check how many points are on my license? Obtain a copy of your driving record at Service Arizona. Click here to request a copy of your driving record. Add up the total number of points during a given period of time. The time period is measured by the dates of driving, not the conviction dates. Will my car insurance premiums increase for an aggressive driving conviction in Arizona? Insurance companies will likely see you as a high risk driver; and as such, either increase your premiums or drop coverage. Can I attend Defensive Driving School to avoid an aggressive driving conviction? No, aggressive driving is not eligible for defensive driving school. It’s a criminal offense that results in criminal prosecution and court dates. Will an Arizona Aggressive Driving Conviction have Consequences if I live in another State? Yes. At the very least, you’re left with a permanent criminal conviction. In addition, your state is likely part of two interstate agreements: Driver License Compact and Non-Resident Violator Compact. These compacts permit states to share traffic violation information. Your home state’s license and insurance may be impacted by any Arizona traffic conviction. An Arizona traffic charge must be addressed in Arizona. If you don’t attend a criminal traffic court date, a warrant will issue for your arrest and your home state can take additional action. Should I consult a Criminal Traffic Attorney for Aggressive Driving? Aggressive driving falls into the most serious category of misdemeanors, and as such, carries some harsh consequences and penalties. For that reason, it’s strongly advised that you consult with a dedicated criminal traffic attorney in Mesa, AZ to preserve your legal rights, protect your future, and achieve the best possible outcome. It’s unwise to represent yourself in any criminal prosecution. If you try to represent yourself, you’ll need to personally appear at all your court dates and negotiate against a trained prosecutor. The prosecutor will have little concern for you or your future. The prosecutor’s job is to convict you, seek penalties, and move the criminal docket. 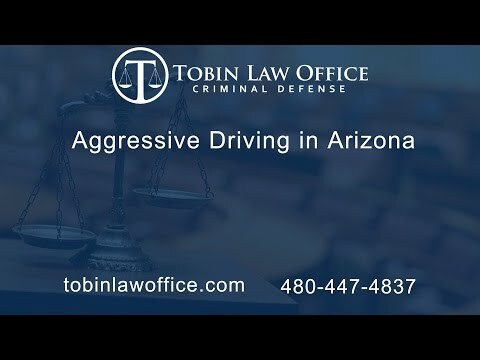 As a former prosecutor that handled aggressive driving cases, Mr. Tobin can tell that the prosecutors and judges see you as number in a large docket of cases. They’re not there to help you or offer guidance. For these reasons, it’s important to consult an Arizona criminal traffic lawyer. How Tobin Law Office Helps in a Criminal Speeding Case. Attend several scheduled court dates, in your place, so you don’t take time from work, family, and commitments. Seek a non-moving violation with no MVD points. Reduce and minimize fines, surcharges, and penalties. Avoid a driver’s license suspension. Avoid points on your MVD driving record. Fight the aggressive driving charge at trial. Move to suppress evidence and dismiss charges based on constitutional violations. Affordable Flat Rates and Payments: Our office defends against aggressive driving charges at very reasonable and affordable flat price. You’ll know the total price up front and find comfort knowing that your rights and options are protected. We offer affordable payment plans. Former Traffic Prosecutor: Mr. Tobin is a former criminal traffic prosecutor and specifically handled aggressive driving cases. Excellent Communication and Contact: Attorney Timothy Tobin handles all aspects of the case. Clients don’t need to go through secretaries or support staff; all clients have Mr. Tobin’s personal email and cell phone. Free and Confidential Consultations: If you reach out, you’ll be put in direct contact with Mr. Tobin to receive free and friendly advice. Mr. Tobin can answer your questions to reduce the anxieties of the criminal process.